Kate was ordained in 2016 and will be serving as Assistant Curate at St. John’s for four years. 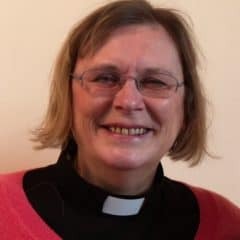 In a previous role she worked for Compassion – a Christian charity working with some of the poorest children in 26 developing countries around the world, and this motivated her to get involved in social justice issues, both at home and overseas. She and John have moved into the Wickhurst Green part of the village and are enjoying being part of the fellowship here.